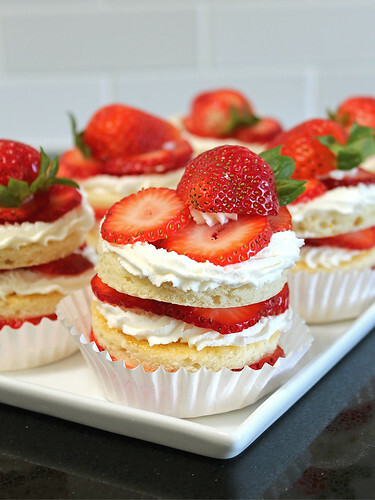 If you’re searching for the perfect dessert for your Fourth of July celebration next week, look no further than these personal-size strawberry chiffon layer cakes. Sure, they’re missing a touch of blue, but that’s easily remedied with some blueberries or blackberries swapped for strawberries in the middle layer — or maybe simply adorn each with a blue sparkler candle to get a little fireworks action going on, too? This cake may look familiar to some, that’s because I made a larger version last year that I totally fell in love with. I really wanted to make that cake for a dinner party I was invited to last week, but I couldn’t figure out a way that I could cut it without getting my fingers all up in its business OR having it topple over in a disastrous mess as typically happens at the worst. possible. moment.
) 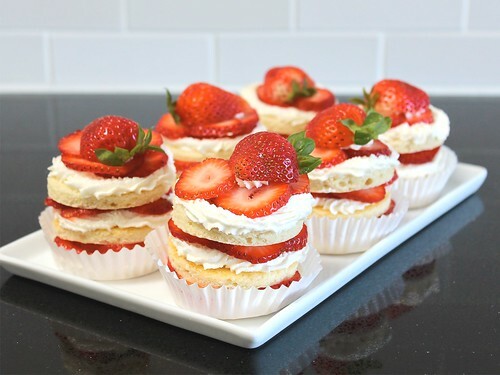 and came up with what you see here: petite stacks of chiffon cake (very similar to angel food), whipped cream and strawberries! Its a really fun way to show folks — or yourself — how beautiful and delicious gluten-free baking can be. And that’s always worth celebrating! Preheat oven to 325°F, line a large, rimmed sheet pan (16 3/4″ x 12″) with a silicone baking mat (you may also cut a piece of parchment to fit the bottom exactly, but I don’t recommend it — it moves around too much, making it difficult to spread, and also gets wrinkly from the cake batter’s moisture); set aside. In a large mixing bowl, whisk together dry ingredients (millet flour through table salt). In a small mixing bowl, whisk together wet ingredients (canola oil through almond extract). In a small dish, whisk together granulated sugar and cream of tartar. Beat egg whites to soft peaks (in a stand mixer with whisk attachment, mixing bowl with hand beaters or by hand with a balloon whisk). Gradually sprinkle in sugar mixture while whipping egg whites to stiff, shiny peaks. Whisk wet ingredients into dry ingredients, just until smooth. Whisk in 1/3 of the whipped egg whites to lighten the batter; gently fold in remaining egg white mixture. Transfer batter to the prepared pan, smooth into an even layer — a large, offset spatula is really helpful. Place pan in preheated oven and bake for 20 – 25 minutes, or until cake is lightly browned, set to the touch and a toothpick inserted in the center comes out clean. Remove pan to a cooling rack, and allow cake to cool to room temperature before removing from the pan (about 30 minutes – 1 hour). Once cake has cooled, run a thin spatula along the edges of the pan to loosen. Using a fine mesh sieve, sprinkle top of cake with a light coat of powdered sugar. Place a sheet of parchment paper over pan (you want it to cover then entire cake), set another sheet pan on top (as though you were stacking the pans), and invert cake. Carefully peel silicone baking mat away from the cake. Using a 2-1/2″ round cookie cutter, cut 8 circles out of the cake; set aside. Brush cooled and strained preserves over remaining cake, cut out 16 circles. Pipe surface of one jam-brushed with whipped cream, arrange a layer of berry slices over top and pipe a small blob (about 1 teaspoon) whipped cream in the very center (this will help the next layer adhere). Top with another jam-brushed cake, whipped cream, berries, small blob of whipped cream (so the exact same process as the first layers). Finally, top with 1 of the 8 plain (non-jammed) cake rounds. Pipe a rim of whipped cream only around the edges (leaving the center “blank”) and top with a generous layer of berries. Pipe a small amount (about 1/2 teaspoon) of whipped cream on the back of a halved strawberry and set on top. Set cake aside. Repeat with remaining cake rounds/whipped cream/berries. Place assembled cakes in the fridge until ready to serve. Best when eaten within a few hours!